Of the dozens of books Dr. Seuss wrote in his long career, three have always stood out as my favorites: “Green Eggs and Ham,” “Horton Hatches the Egg” and “How the Grinch Stole Christmas.” I love them for the brilliance of their poetry. Their amazing illustrations. Most of all, I love these books because of their message. Try it, you might like it. Say what you mean and mean what you say. Christmas doesn’t come from a store. Last week, while visiting a library in Denver with granddaughter Josephine, we checked out a book I hadn’t read in years. 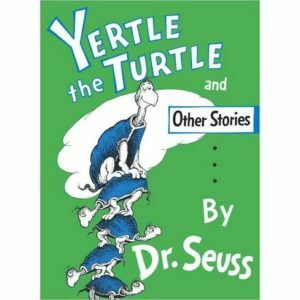 “Yertle the Turtle,” first published in 1958, was hardly a blip on my screen until I read it out loud to Jo. Now it’s at the top of my Seuss list. If it’s been a while since you read it, or if you never have, here’s the story: Yertle the Turtle was king of a lovely little pond on the Island of Sala-ma-Sond. It was clean. It was neat. There was plenty to eat. The turtles had everything turtles might need. And they were all happy. Quite happy indeed. But Yertle soon decided his kingdom was too small. His throne wasn’t high enough. And so he ordered the turtles in the kingdom to stand on each other’s backs, with him on top, until he could see for miles. “I’m Yertle the Turtle! Oh marvelous me! For I am the ruler of all that I see!” he declared. If this sixty-year-old fable is starting to sound prophetic of what’s going on right now in this country, hang on to your hats. There’s more. A plain little turtle named Mack ended up, through no fault of his own, at the very bottom of the stack. Though Mack hated to complain when more and more turtles climbed onto his back, it was almost more than he could bear. “How long must we stand here, Your Majesty, please?” he implored. Mack made one last attempt to negotiate: “Your Majesty, please, I don’t like to complain, but down here below, we are feeling great pain. I know, up on top you are seeing great sights, but down on the bottom we, too, should have rights. We turtles can’t stand it. Our shells will all crack! Besides, we need food. We are starving!” groaned Mack. I won’t ruin the story by telling how it ends, except to say that Yertle the Turtle got his comeuppance. As it was on Sala-ma-Sond, so may it be in the good ole USA.